Wow! 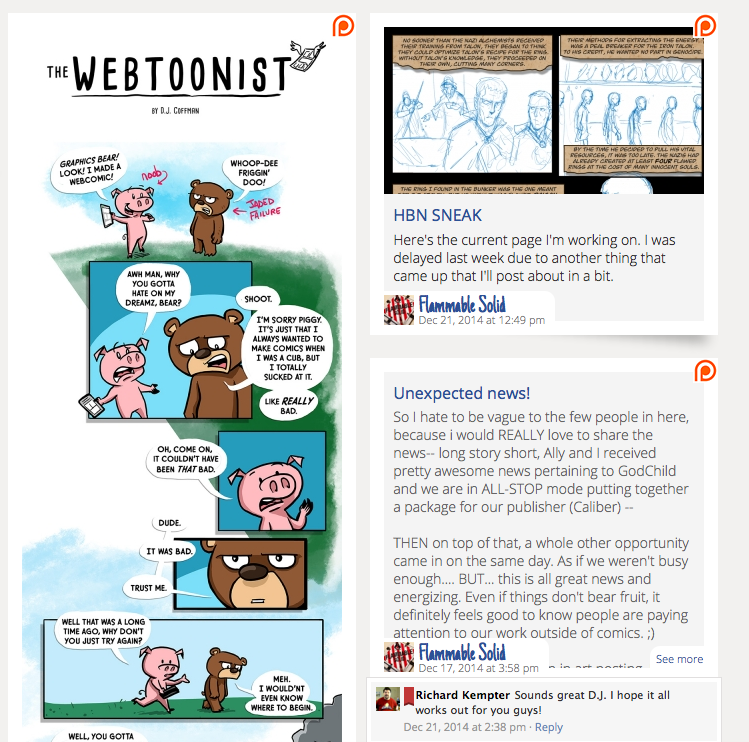 2014 has been a great year for me on the creating front and getting back into making the comics… ALL OF THE COMICS. I wanted to talk a little about what I’m up to currently and how you might see even more. Ally and I are about midway done with the first big graphic novel. 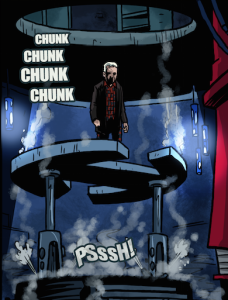 It can be read weekly at http://godchild.keenspot.com (mature readers) -I now cover all of the art chores on the book, (pencils/inks/colors) and it’s been a blast. We had to amicably part ways with the old coloris t and my old friend Adam Black who seems to be suddenly crushed with his own successes with his subscription comic Locus GodSlayer and a bunch of freelance work. Taking on a project like GodChild is a huge endeavor on it’s own. Much thanks to him for helping us get started and being WAY affordable and kind. I’ve been having a blast doing it on my own. It’s really a different way to approach the page than just pencils or inks. Lots of fun… but I’m also kicking it into high gear to get this big book done because…. We didn’t make a big scene about it, but we signed with Caliber Comics in July to be the official publisher of the graphic novel when complete and a follow up book. I’ve been quietly stoked about Caliber coming back. Things are low key for now but ramping up slowly for us. Caliber used to publish some of my favorite indy comics back in the day, so even to be mentioned alongside them I consider an honor. Some people have jokingly called me “indy comics legend” at shows (thanks a lot Chris Yambar!) but the REAL Indy Comics legend is someone like Gary Reed who has seen every side of the business and helped to launch the careers of some of the biggest names in comics today. 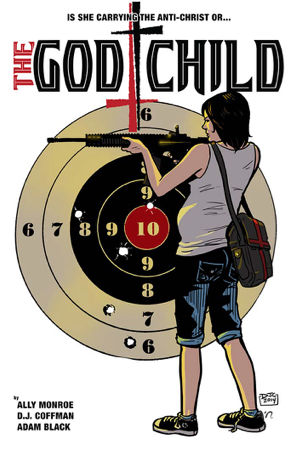 So there, I finally emoted about how awesome it is to even say… CALIBER COMICS is our publisher for GodChild, and we couldn’t be happier. Just a little look at what the secret activity stream looks like. I would tell you more about this, but it’s a secret right? Oh, okay… I’ll let you in on it. 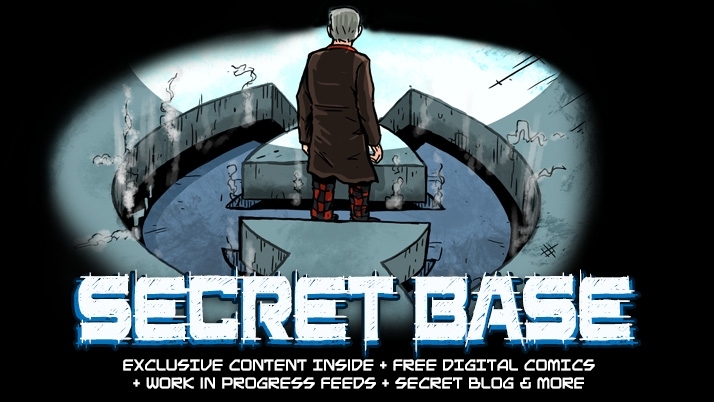 “SECRET BASE” is basically our Patreon.com/comics campaign to help us raise money to produce MORE comics. 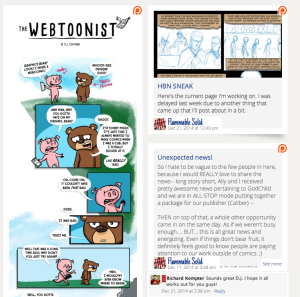 It’s a “pay what you want” model, and patrons get exclusive access to the secret activity stream. On different levels I’ll be sharing behind the scenes art, from pencils, inks, colors. Plus fans of GodChild or Hero By Night will get to read the comics in advance of the public and watch them as they come together. As you can see, Ally and I have a BUNCH going on. And actually I’ve been reminded that there are TWO more little projects that are also in the works on the side. It feels great to be creating things again!